Some people ‘Eat to Live’ while others (like me) ‘Live to Eat’! If this is not enough a reason to feel the gluttony, then we have trends like ‘Street Food’ to ‘Fine Dining’; making the experience an extravagant affair. While street-food can be a part of your daily eating binging diaries, fine-dining is usually reserved for the special occasions. Speaking of fine-dining, India excels in the art of making the dining experience luxurious & royal! And who better to present the king-size rich spread than our very own ‘Saddi Dilli’? The city of splendid multi-cuisines, Delhi offers the finest of fine dining experiences that truly mark a memorabilia for tourists and foodies. Celebrating the extravagance that Delhi has to offer, I present to you the top 5 Fine Dining Restaurants in Delhi. 1. Dum Pukht – Dating back to centuries, Delhi kitchens expertise in Mughali cuisine that has been brought down over generations of Nawabs. If you are a non-vegetarian and well-done red-meat is your style, then look no further. ITC Maurya Sheraton’s Dum Pukht doesn’t just mesmerize with its regal ambience, but the menu of ‘Murgh Chandni Kabab’ to ‘Mirch & Baigan ka Saalan’ leaves one’s taste buds tantalized too! 2. Varq – For those who are looking for the desi dressings with an unusual twist, Varq is the place to be at. The ambiance to the likes of a Rajasthan style royal Gharana, give your taste buds a twist with exotic ingredients like morels, sand crab and Iranian dry-fruits. The menu is a perfect blend of old style cooking and modern chef’s palette with delectable dishes like ‘Martaban ka Meat’, ‘Teen Mirch Curry’ and desserts like ‘Passion fruit Kalaakand’. 3. Indian Accents – Do you like experimenting? If trying out anything ‘hatke’ is what you aim for, then Indian Accent is your shrine! Serving the ‘Contemporary Indian Cuisine’, celebrity chef Manish Mehrotra has left no spoon unturned to make the menu a success. Intimate fine dining experience is what makes a visit to this food abode, an interesting affair!. Try out their Chicken Khurchan Phulka taco & Blue Cheese Naan while you’re at it! 4. Rara Avis – Take a trip to Paris & back. The finest French cuisine serving restaurant, Greater Kailash’s Rara Avis is a romantic paradise. Not just a gourmet French-bistro style menu, but Rara Avis offers a picturesque city view terrace sitting that makes the ambience tres magnifique!This culinary paradise expertise in platters like ‘Noix De Saint Jacques A La Bretonne (scallops dressed with Brittany sauce, Cordon Blue and the very famous Crème Brule. Bon Appetite! 5. Set’z – For those who are looking for a more vibrant oriental experience, indulge in a weekend meal at Set’z. 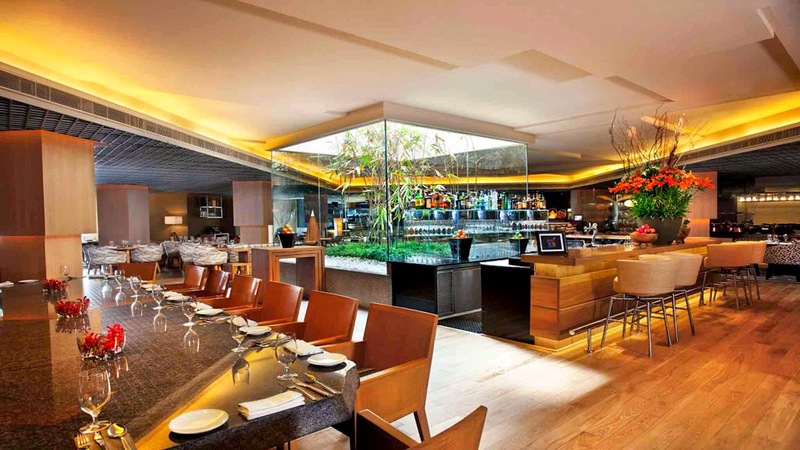 Nested in the posh grounds of DLF Emporio, this fine dining restaurant offers nothing less than extravagant. Pork lion with green apple, Cheung Fan rolls, Yakitori skewers and an assorted platter of their signature kababs is what we personally recommend. Apart from oriental, their fine platters also offer Indian, European and Middle Eastern cuisines. Now that we have shared our list of the 5 Fine Dining Restaurants in Delhi, reserve your upcoming weekends and experience luxury and gourmet under Delhi roofs. For those who have already been through and through with these 5 gourmet hubs, surf up the entire list of Fine Dining restaurants in Delhi at askme.com as this city has a lot to offer!